Samsung Galaxy S8 and Galaxy S8+ are set to launch in under a week, and every new day brings a new bag of leaks. Fresh reports shed light on the changing display resolution feature, more pictures that show the phone from various angles, a video teaser that hints at iris scanning, photos of the internal battery, and images of the retail box. First up, tipster Ice Universe has shared multiple images of the Galaxy S8 and Galaxy S8+ showing us the device’s front and a unique screen resolution changing feature. 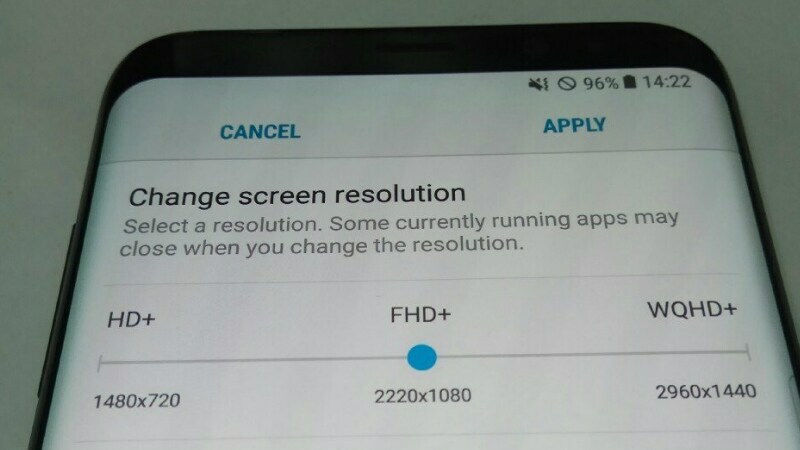 According to the image shared, the smartphones will give you three options for screen resolution: HD+ (720×1480), FHD+ (1080×2220), and QHD+ (1440×2960). Of the three, the default resolution is QHD+, and this option is given to users who prefer smaller icons and need more to fit on a screen. This isn’t a new Samsung feature, and has been spotted on previous versions as well. 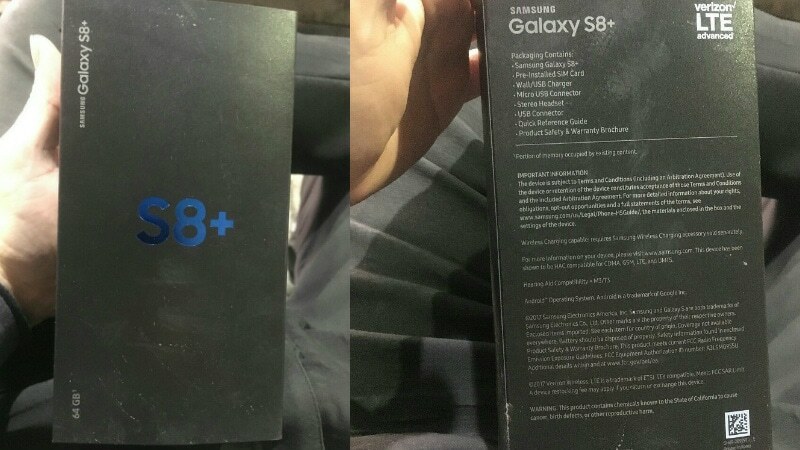 The same tipster also leaked the retail box of the Galaxy S8+ confirming that the larger variant will sport the ‘+’ symbol, and not the word Plus. The retail box also reveals that it will contain a charging adapter, a Micro-USB connector, and a pair of headphones. According to previous leaks, Samsung is expected to bundle AKG-made earbuds, but there’s no clarity on that from the leaked retail box. Separately, the Galaxy S8 and Galaxy S8+ batteries have been leaked by Slashleaks. The battery images confirm that the smartphones will pack 3000mAh and 3500mAh batteries, reiterating previous rumours. If this leak is true, then the Samsung Galaxy S8 will sport the same battery as its predecessor Samsung Galaxy S7, and the Samsung Galaxy S8+ will have a smaller battery capacity than the Galaxy S7 Edge, which packs a 3600mAh battery. Notably, the Samsung Galaxy S8+ has the same battery as the Galaxy Note 7 that was shelved last year. As for the Galaxy S8 and Galaxy S8+ battery specifications, even though they haven’t increased on paper, Samsung presumably should have integrated internal optimisation for more juice. The other reason for not pushing the limits on battery size could be the disaster that ensued with the Note 7 last year, and given the casualties, we are glad Samsung is taking the safe road. Samsung’s new teaser has also been outed, and it hints at iris scanning capabilities. The video teaser shows a man standing in a green field, and once the camera pans out to show the whole garden’s aerial view, it forms the shape of an eye. This could mean the introduction of iris scanning on the Galaxy S8, a feature that was also seen on the Galaxy Note 7. See the video teaser here. The smartphones are all set launch at the company’s Galaxy Unpacked 2017 event on March 29 in New York, and it will kick off at 11am EDT (9:30pm IST). According to the rumour mill, the Samsung Galaxy S8 price will start at EUR 799 (roughly Rs. 56,000), Galaxy S8+ at EUR 899 (roughly Rs. 63,300), new Gear VR will cost EUR 129 (roughly Rs. 9,000), new Gear 360 will be priced at EUR 229 (roughly Rs. 16,100), and an accessory that could provide a Continuum-like called DeX could be priced at EUR 150 (roughly Rs. 10,500).